thanks for reporting these problems. Should be fixed in next release. jquery 3 and selection problem remain to be addressed, for next release. jquery 1.12 seems to be enough for this template, so i'll try to embed that instead. I've found that the 'move' functionality was broken in beta2. You'll find attached the template for the next beta. I hope you like it (Rejetto: you can EASILY see and review all the changes HERE or using this online tool). Please report if something is not working. Remember that the latest stable version of HFS (v2.3m), used jQuery version 1.4.2 and not 1.12. Another thing: you've used .on( method of jQuery, which was implemented on jQuery v1.7, so, before switching back to jQuery v1.4.2 you will either have to modify any function using it, or use this tiny polyfill (found here, not tested). Also the .split( method of jQuery may not be found on jQuery v1.4.2 (but I'm not sure about that). Quickly tested. Also works with IE11 except for the More Options buttons. i don't think it should support every browser. what browser are you trying to support? it's ok if we get compatibility with other templates, it's not necessary to use the same jquery version. Also the .split( method of jQuery may not be found on jQuery v1.4.2 (but I'm not sure about that). i quickly tested the templates Live and ToG, for jquery 1.12 compatibility, and they look good. I use SRWare Iron 31 (Portable edition), because it's the fastest browser on Windows XP (other browsers are very slow and take a lot of resources). If you don't care about me, don't do this for me, but think that the same Chromium engine is used by default on many Android's browsers (Android 4.0.3 to 4.4), and not everybody have Android 6 to 8 with the latest browsers. I see you didn't used the most important parts of my changed template (after all the time it took me to do it). I really can't understand why you insist on using 'ECMAScript 6'. For as much web developers try to make (aka 'force') people upgrade your browser, there are many situations (like old hardware) where it's impossible to always have the latest browser and operating system. On my case, Windows 7 is too slow for old hardware, and the support for new browsers on Windows XP is every day more limited. - Possible bug found #1: add a real folder, then on root set 'access' and 'delete' to anyone, then try to rename that folder trough the browser, and you will see that the folder it's now NOT shared anymore (the folder is renamed OK on the server's hard disk, but it's not updated on the HFS VFS). - Possible bug found #2: add a real folder (with several sub-folders inside), give to those inside sub-folders a different comment to each folder. Now rename one of those folders, and the comment for that folder is gone (what really happens? : when HFS rename that folder, it doesn't update the folder name in the 'descript.ion' file, so the comment doesn't get displayed). The same happens if you rename a file that had a comment. - Here is another different bug report about comments. - Design issue? 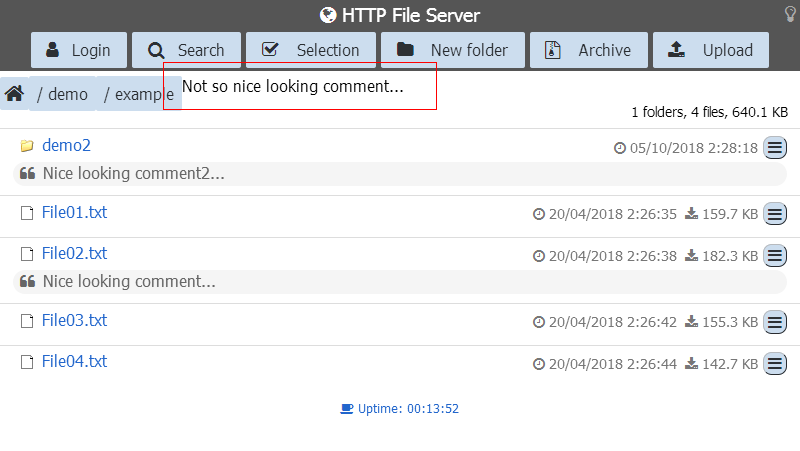 : if you give a comment to a folder, that comment gets displayed next to the folder path, without any design or indication that it's a comment. Here is a screenshot of what I'm talking about. I'm attaching to this post an updated template, adding the changes from your latest template of HFS v2.4 Build 3 (hfs24b3.exe) [you can see here the differences from the template of Build 3], just in case you care about it. - "menu > VFS > Load single comment file"
- "menu > VFS > Support DESCRIPT.ION"
remotely modify the vfs may conflict with the option "Save options >> Autosave Options"
i never met the problem before now. I studied it and have found the problem: it's the transparent border in the <a>. TypeError: newQ(...).on is not a function. but think that the same Chromium engine is used by default on many Android's browsers (Android 4.0.3 to 4.4), and not everybody have Android 6 to 8 with the latest browsers. so you suggest to support android 4 system browser. Anyway, we don't have to have all the features working on old browsers. Browsing and downloading would be a basic set. Browsing means also login. I guess that a very old hardware won't be the "main" system, and just need to access to files remotely. What you think? I really can't understand why you insist on using 'ECMAScript 6'. > EDIT: I guess you don't care about users like me, the same as more and more people everyday care less for the others (we have the 'global warm' just because that attitude of 'not caring about his neighbor'). don't rush, my dear Opinions are mostly made by experience. Everybody's experience is limited and doesn't always produce the best of results. I don't see any XP in my life, these days, so you can understand my starting point. I'm just not doing something before understanding why, still discussing, exchanging views and information. look, i'm sorry you are feeling this way. I think it's the result of coming to conclusions too fast. I didn't decide about this thing, but that's exactly why i didn't include your work yet. I'm discussing it, to understand and try to make a decision.